Eric Herm, (organic farmer, author, activist and musician) translates modern day agriculture and life through various mediums and venues in his own unique West Texas manner. With plow, pen, guitar and sarcastic wit, Herm plunges forward into a world of tumbleweeds, sandstorms, droughts, GMOs, and rural existence. Surviving Ourselves is about the vital relationship between Nature and the human spirit. In our intensive agricultural systems, our many ill-conceived business and political policies, this relationship has become fragmented. Through his own personal experiences, as well as the inspiring stories of others, this fourth-generation farmer relays a message of revolution and evolution that starts within ourselves. The resulting transition will help humanity adopt a more sustainable paradigm of existence. 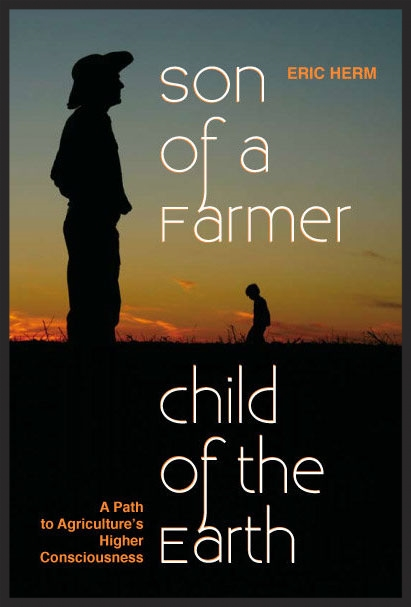 Son of a Farmer, Child of the Earth examines commercial agriculture's strain on our natural resources, ecosystems, and the farmer. As a fourth-generation farmer, Eric Herm deals with the harsh economic realities and complicated legislation facing farmers, as well as the undeniable health impact of GMO crops and excessive chemicals. The book provides resources of natural, healthy alternatives that will inspire the farmers' transformation from corporate-motivated producers back to the flesh and bone guardian angels of the Earth. Herm's strong, direct message is not only for farmers, but humanity as a whole.